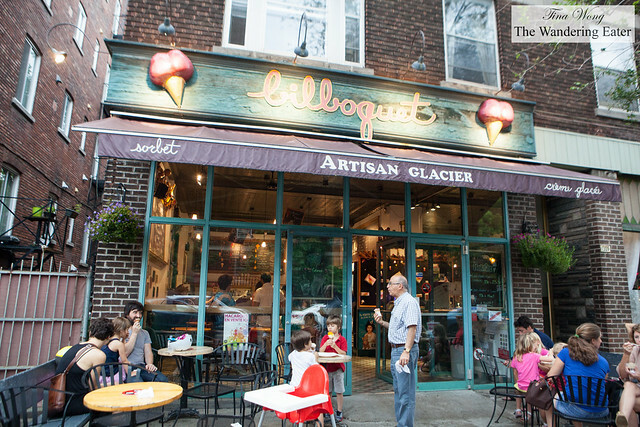 Le Bilboquet is an artisan ice cream institution in Montreal. 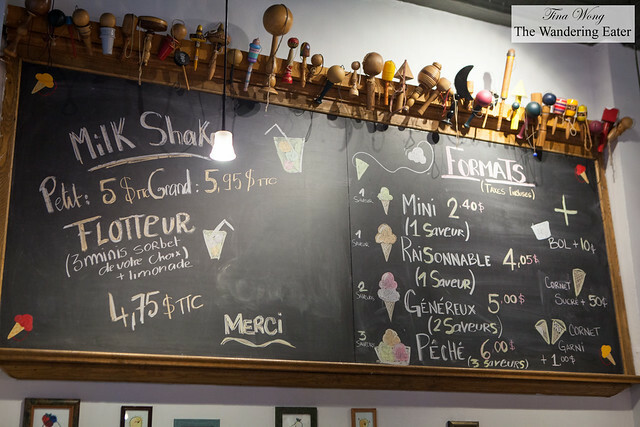 It opened in 1983 by Carole Lavallée and Yves Lebuis and eventually in 2004, Pierre Morin took over, with the hope of serving ice cream that feels like home but cares about using the best ingredients possible. The brand uses only fresh 3.25% milk, 35% pure cream, and 100% fruits and juices without additives or artificial colorants. 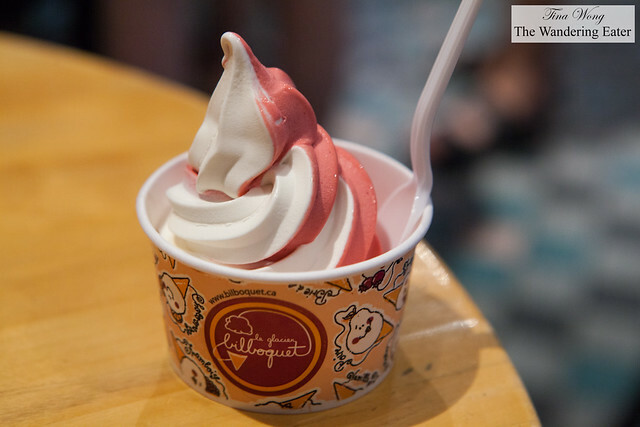 Cookies, brownies and other confections that are incorporated into Le Bilboquet ice creams are mostly produced by an in-house pastry chef. 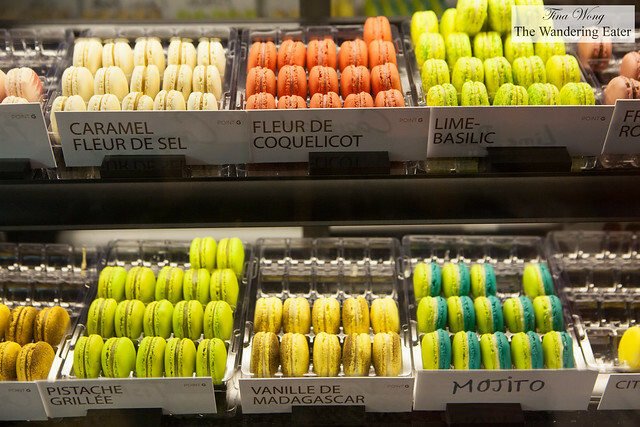 The sorbets contain up to 80% fruit, and there is no air added. Le Bilboquet also prioritizes developing environmentally friendly products through recycling policies. I visited to Le Bilboquet’s Mount Royal location during the late afternoon on one of those unpleasantly humid days that you feel like you’re drenched in sweat the moment you step out of the shower. 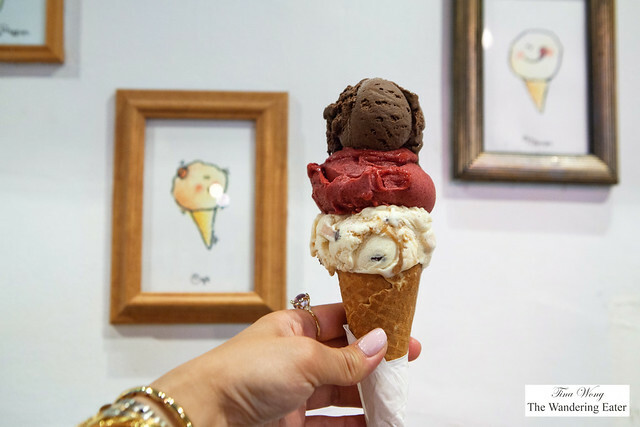 Their ice cream shop is near a residential area and it does feel like a welcoming, old school ice cream shop with the rainbow of ice creams and sorbets, and even their ice cream macarons. There is a separate freezer containing their ice cream cakes. There is a line of customers waiting to order their ice cream in this unbearable heat. I started off with their new vanilla soft serve ice cream swirled in raspberry sorbet. Both were creamy in texture. Both tasted like its flavors – vanilla and raspberry. They made the ice cream mix themselves rather than using a commercially made mix that most soft serve ice cream brands use. Still felt the need to try their scooped ice creams, I went for the triple scoop on a cone. I had their raspberry sorbet, 70% chocolate ice cream and their vanilla ice cream with a caramel swirl and chocolate candy (forgotten the cute flavor name). This beautifully tall, quickly becoming a leaning tower of ice cream and sorbet had to be eaten quickly and asked for a large cup to at least save this beauty from hitting the floor. When I grabbed a spoon and started to take small bites of each flavor, they were absolutely delicious. The chocolate was deep and not too bitter. The raspberry sorbet was dense and packed with lots of its wonderful sweet-tart flavor. The vanilla ice cream with the mix-ins was sweet but not overtly so. It was all very tasty.